This image shows the atom positions and electron density in a possible entropy-stabilized high temperature material. Image: Cormac Toher and Stefano Curtarolo of Duke University and Zsolt Rak of NC State University. North Carolina State University (NC State) is taking the lead in a new initiative aimed at addressing fundamental scientific questions that could lead to the development of so-called ‘entropy-stabilized alloys’ that can withstand extremely high temperatures. The initiative also includes Duke University, the University of Virginia and the University of California, San Diego, and is funded by a five-year, $8.4 million grant from the US Office of Naval Research (ONR). "The Department of Defense (DoD) has a need for materials that are mechanically and chemically stable at ultra-high temperatures – meaning temperatures of 2000°C or more," says Don Brenner, professor of materials science and engineering at NC State and principal investigator under the ONR grant. "These materials can have significant aerospace applications, but the number of usable materials is currently small, and those materials rely on strong chemical bonding to remain stable. At high temperatures, most materials are simply no longer stable." To address the shortage of ultra-high temperature materials, ONR has tasked Brenner and the rest of the research team with investigating the viability of creating entropy-stabilized alloys that can withstand these temperatures. Entropy-stabilized alloys are materials that consist of four or more elements in approximately equal amounts, and they have garnered significant attention in recent years because they can possess remarkable properties. These alloys are particularly of interest for ultra-high temperature applications due to their unique ability to ‘absorb’ disorder in a material's crystalline structure that otherwise would lead to the breakdown of the material. Crystals are composed of a repeating arrangement of atoms, which can be different from crystal to crystal. That arrangement is called the crystal's ‘lattice type’: one crystal may have its atoms arranged as a series of cubes while another crystal may have its atoms arranged as a series of three-dimensional hexagons. As the temperature of a crystal is increased, it begins to lose its ordering. That means that individual atoms may start to move around. And when those atoms get rearranged, it can affect the structure - one of the cubes might start changing into a different shape. This can occur in several different ways, including as a result of distortions in the lattice or atoms missing from their lattice sites. At high enough temperatures, this disordering can lead to melting, or otherwise cause a material to lose strength. But in entropy-stabilized alloys, the mix of elements can be arranged in many different ways for a single lattice type. In other words, the structure can continue to be a series of cubes, even if the elements that make up the structure get shuffled around. Researchers think this ability to retain structural integrity even as the atoms become disordered could result in increased melting points and so produce materials able to withstand ultra-high temperatures. The ONR grant calls on the research team to develop the scientific concepts needed to determine whether it's possible to create ultra-high temperature high-entropy alloys – and, if it is possible, how to do it. 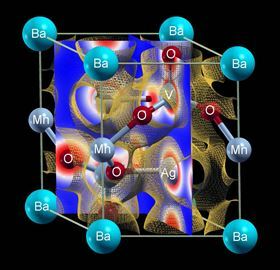 The researchers will also be developing and modifying computational techniques for identifying the most promising high-entropy alloys, which can then be targeted for additional experimental testing. "It's also important to stress that all of this work is truly interinstitutional, drawing on expertise from all of the parties involved," he adds. And the researchers won't be working in a vacuum. There will be significant input from a variety of third parties to help guide the work. "Researchers from Lockheed-Martin, the Naval Air Weapons Station at China Lake, the Air Force Research Laboratory, and the Naval Research Laboratory, together with other DoD-related laboratories will help to advise our work, especially in terms of DoD and civilian needs," Brenner says.